Abacha the meal, is one of those meals that are prepared with lots of ingredients. 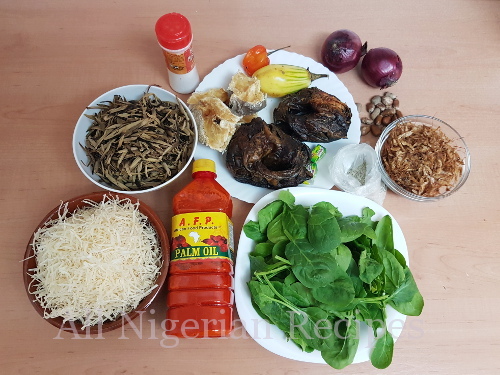 Here is a full option Abacha that contains all the possible ingredients. If you do not have Abacha or you are on a low carb diet, prepare Cucumber Abacha. Abacha (the ingredient) is made from cassava. The cassava tubers are cooked till done then sliced with a special grater. The sliced cassava is then soaked in cold water overnight, washed thoroughly and dried under the sun. With Abacha, the more ingredients you use, the tastier and more "complete" it will be. So use as many as you can lay your hands on. Abacha is the main ingredient. Abacha is made by boiling and grating/shredding cassava tubers. 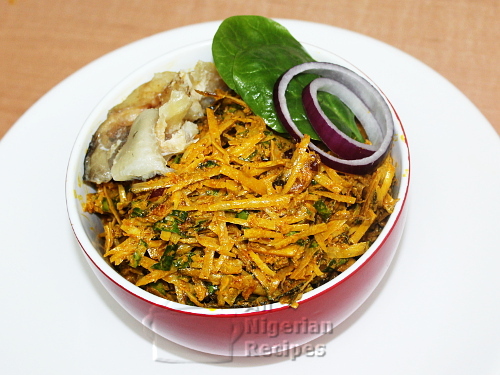 Click here to see how to make abacha. 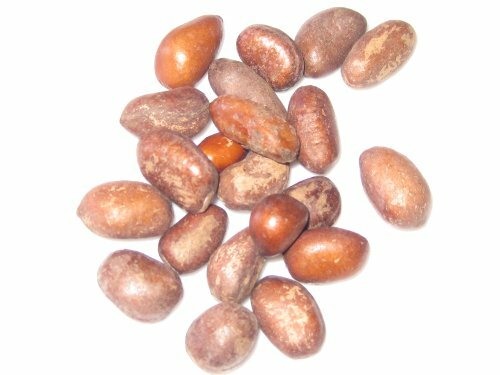 Ukpaka or Ugba is shredded oil bean seeds. It is compulsory for me but if you do not have it, you can skip it. Red Palm Oil must be used when preparing abacha. Other oils are not acceptable. You must add a green leafy vegetable. Garden Egg leaves are used for abacha. If you do not have it, use leafy spinach especially the baby ones. Very good alternative. At least one type of fish must be used. 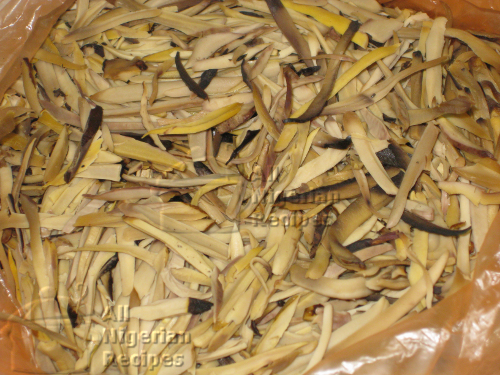 For abacha you can use stockfish (dry cod), dry fish (dry cat fish, mangala), fried mackerel (fried titus) and smoked fish. Crayfish much be used, click here to see how to prepare crayfish (for those outside Nigeria). Pepper must be used and you can either add habanero pepper (recommended) or dry cayenne pepper. Habanero pepper is atarodo, atarugu or ose oyibo. Black pepper is not a good fit for abacha. 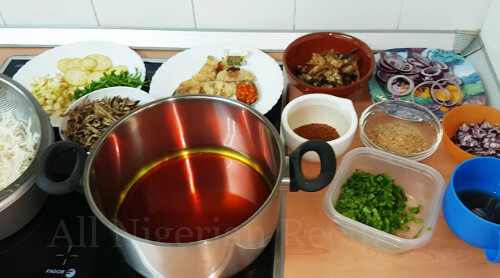 Add ogiri Igbo for the classic traditional taste but if you do not have it, add stock cubes. One of these must be used unless you are really really allergic to both. Add garden egg. It is great in abacha but not compulsory. 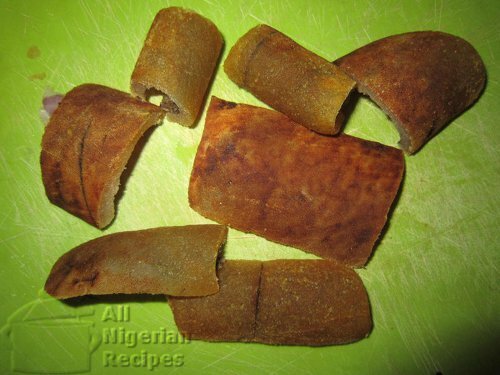 Edible potash: akanwu, kaun, keun is what makes palm oil curdle and it is a must. 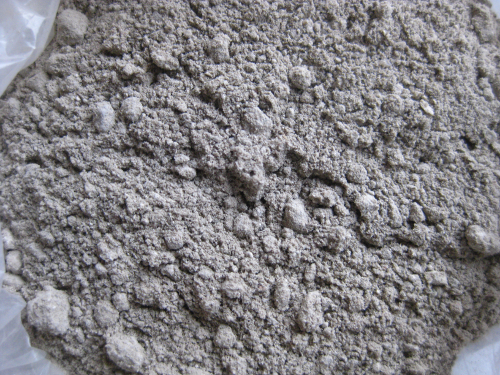 If you do not have it or you do not want to eat edible potash, baking soda (bicarbonate of soda) has similar properties. Click here for more information. Be careful when adding salt to abacha. This meal contains lots of ingredients that already have salt: stockfish, stock cubes, crayfish etc. Most often I do not need more salt. All the work of making Abacha goes to preparing the ingredients. Soak the dry fish in cool water and set aside to soften. Soak the abacha for 2 minutes in cool water and put in a sieve to drain. Rinse the stockfish and cook till soft. I use a pressure pot for this. Debone when it is soft. Mix the edible potash with some water, stir and set aside. When the dry fish is soft, clean and debone. Then break into small pieces. Cut one of the onions into tiny pieces and cut the other into rings. See the video for what I mean. Rinse the leafy vegetable, cut some into tiny pieces, some into thin stripes and leave some leaves whole. Rinse the ukpaka and put in a sieve to drain. Cut some garden egg into tiny pieces and some into thin discs. Crack open the ehu seeds and grind with a spice grinder. Melt the palm oil in a sizeable pot over low heat. Note that this is melting not bleaching. The oil should not even be hot. If your palm oil is in liquid form, no need to use heat. Just pour it into a pot. All the ingredients are ready! When mixing the Abacha ingredients, it is important that all the ingredients are well incorporated. Add similar ingredients, stir and add another batch. It is not recommended to add everything all at once and stir because it will be very difficult for you to get a good mix of all the ingredients. Slowly decant the liquid from the edible potash into the palm oil and stir at the same time and you will see the palm oil thicken and turn yellow. Make sure that the edible potash sediments do not go into the pot. Add the stock cubes (crushed), ground ehu, ground crayfish, diced onions, blended habanero pepper, tiny vegetables and mix well. Add the abacha, ukpaka, pieces of dry fish, diced garden eggs and mix well. Taste and only add salt if necessary. You can warm it up a little bit before serving. It can also be served at room temperature. Serve with the onion rings, discs of garden eggs, stripes of garden egg leaves and the whole garden egg leaves. Throw in a chilled drink. Palm wine is the best for Abacha. Watch the video below to see how I did mine.